Mmm Mmm Mmm! I just whipped this up quick for dinner and it was so tasty I wanted to share it with everyone! This really is an EASY recipe. Anyone can make this... no excuses! My friend Brianna always says "you make it sound like it's so easy", but really IT IS!! Trust me! Just follow these easy steps and you'll have a hot, delicious meal in front of you in less than an hour. 4 Large Green Bell Peppers - Tops removed, cleaned out. First things first, get a pot of water boiling. Add a little salt to your water. Drop in your bell peppers. We're only going to parboil these peppers, which is to boil them for about 2-3 minutes. Then remove them with a slotted spoon and set them aside in your pan. We're going to take a large frying pan and put enough oil to cover about 1/8 of the bottom of the pan. Once the oil is good and hot, add in everything from the first group of ingredients. We're gonna keep this going over a medium high heat, browning the beef and pork and cooking down the onions and bell peppers. Once everything is cooked, strain it out, get rid of the excess fat and grease and throw it back on the heat. Drop the heat down to medium, and mix in everything from the second set of ingredients. Let this cook for about 10 minutes, and then lets start stuffing the peppers. You should have enough of the mixture to stuff each of the peppers pretty full and then enough to fill in all the gaps in the pan around the peppers. 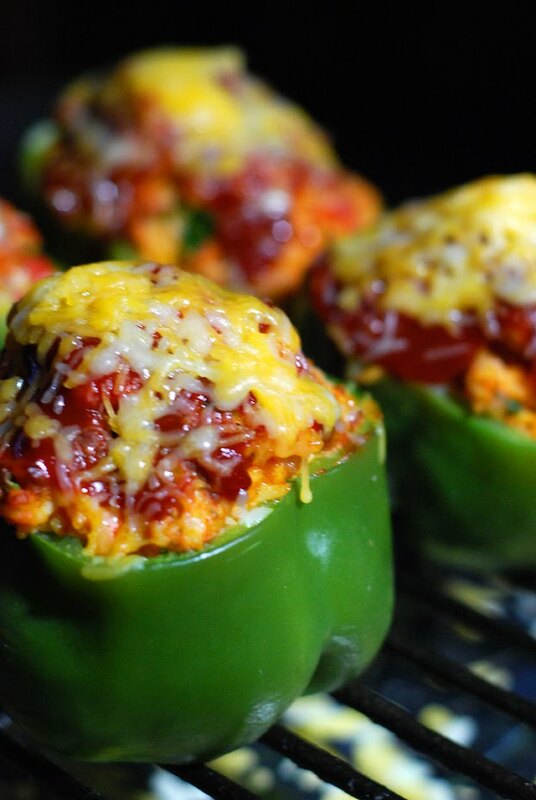 Once your peppers are stuffed and the pan is full, let's sprinkle the mozzarella and parmesan on top. Throw those bad boys in the oven, which should be preheated to 350 degrees. Let em back for about 30 minutes. When they come out the cheese should be melted and browned slightly. The filling will be piping hot, so be careful. We enjoyed ours with a side of yams and garlic toast. I hope you enjoy this recipe! If you make it, let us know how it turned out, and don't forget to "Like" Hungry Jerks on Facebook!